First, a program note is in order. This column is woefully late, I realize. I was on vacation for the first week of the month, and then the backlog of important issues demanded my attention earlier this week. Also, since September is already one-third over, I am not going to offer up many predictions at the end of the column, since I feel it would be cheating when I've got data to look at that I normally wouldn't. Also, because I am feeling lazy. All in all, what this means is that it's going to be a very short column this month, so my apologies. We'll be back on our normal schedule next month, I promise. August wasn't as dominated by congressional bickering, due to their taking the entire month off. The situation with children at the border eased considerably, which also drove it off the front pages and the headline news. The situations in both Ukraine and Israel had their ups and downs, but both seem to be calming down considerably -- a welcome relief. Countering these trends, however, was the worsening situation in Iraq and Syria. The beheading of American journalists provoked a sharp response among the American public (as it was, no doubt, designed to do), and the country awoke from its "war-weary" phase to begin a wave of support for military action. Obama began airstrikes against the Islamic State (or ISIS, or ISIL) but on a limited basis. A humanitarian crisis was averted on a mountaintop, and the most important dam in Iraq was taken back from the terrorist group. The Kurds began turning the tide against the Islamic State, to the point where they were not taking new territory but actually beginning to lose ground (albeit, very slowly). Overall, it was a mixed month news-wise. This was reflected in Obama's approval ratings. His monthly average job approval rating essentially stayed the same at 41.6 percent, falling only 0.2 percent in August (after falling 1.6 percent in June and 0.6 percent in July). But his disapproval rating showed a surprising turnaround in August, improving 0.6 percent to finish the month at 53.0 percent. Again, this is going to be a truncated view of the trends, due to the lateness of this column. President Obama's job approval stayed extremely flat in August, which bucks the general trend of Obama having pretty horrible Augusts in past years (except during his second election). Take a look at the data for past Augusts: 2009 -- 3.6 percent drop; 2010 -- 1.3 down; 2011 -- 2.4 down; 2012 -- 0.6 up; 2013 -- 0.9 down. Seen in that light, a 0.2 percent downturn isn't all that bad. What it really represented was a flattening out of Obama's job approval, perhaps a "bottoming out" floor from which he will rise. He certainly is scraping the bottom of his own record, since he is now only 0.2 percent above the worst-ever job approval he has charted (in November of last year, during the Obamacare website disaster). In daily averages, Obama started the month at 41.6, fell briefly to 41.0 early on and then rose to 42.1 towards the end of the month. This represents movement of only 1.1 percent for the whole month -- which is an incredibly low range of movement. The big surprise was Obama's gains in the job disapproval rating. For the month, Obama improved more than half a percent to end with a monthly average job disapproval rating of 53.0 percent, down from 53.6 percent in July. In the past two months, this number has risen 1.7 percent (June) and 0.2 percent (July), so this could signify a turnaround. The daily disapproval averages seem to reflect this as well. Obama started the month at 55.3 percent, then steadily fell to hit 51.9 percent and he finished the month at 52.0 percent. That is a lot of movement -- a range of 3.4 percent -- and the trendline was clearly in Obama's favor all month long. 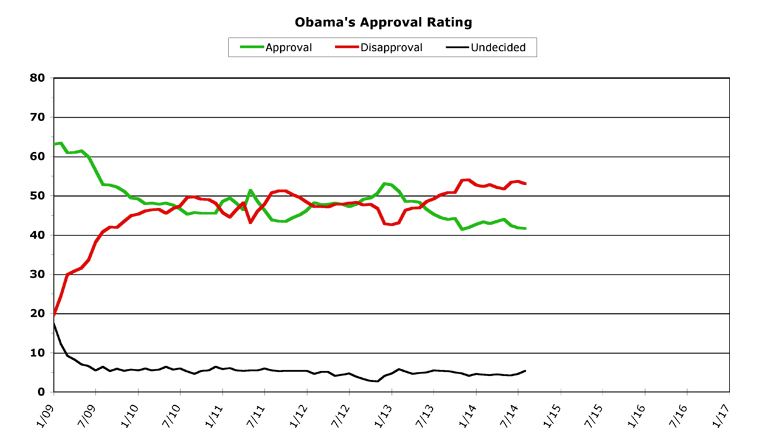 Obama picked up most of these gains from moving people from "disapprove" to "undecided" though. The undecided category rose to 5.4 percent (from 4.6 percent), after a very long time in the mid-to-low 4-percent range (from 4.2 to about 4.6 percent, since last December). The undecided category hasn't been this high since last August, in fact. Overall, Obama improved the gap between approval and disapproval by 0.4 percent. This is the first such gain since May, but it still leaves him 11.4 percent "underwater," and it still leaves him with a very low approval rating heading into a congressional election season. 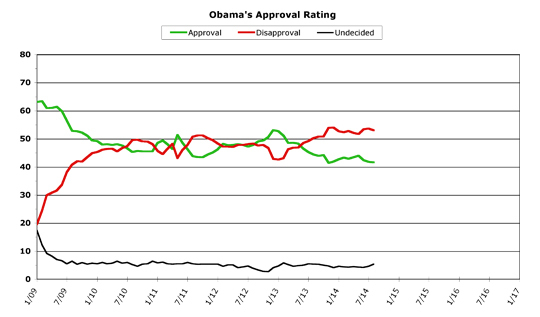 We'll see whether Obama can improve further -- and, crucially, begin turning his approval trend around -- next month. Across the board, Obama is losing ground..
What's it going to take for ya'all to admit that Obama is not the messiah ya'all think he is??? Well, I'll be happy enough to know what it will take to stop YOU from asking incredibly stupid and wholly non-serious questions. S E R I O U S L Y ! It's a VERY serious question..
JL is on record as taking Obama to task for his bonehead Education moves..
You have joined the ranks of the realistic people by thumping Obama for his bonehead Foreign Policy moves.. But everyone else is of the firm opinion that Obama can do no wrong.. Despite ALL the evidence to the contrary.. So, the question is a serious one.. But I will add a clarification..
For those who believe Obama is the second coming, what's it going to take for ya'all to admit that Obama is NOT the messiah?? And Weigantia would just be another echo chamber where Obama is all goodness and light.. Uh huh.. Ditto.. You said it man!! Obama is awesome etc etc etc ad nasuem.. I have long been afraid that Weigantia is in danger of becoming something as uninteresting as your idea of an echo chamber. You don't see it, Michale, but, you are largely responsible for it. So, the question is a serious one.. But I will add a clarification...For those who believe Obama is the second coming, what's it going to take for ya'all to admit that Obama is NOT the messiah?? The tenor of discussion around here would rise to a much higher level of seriousness if you would dispense with your mind-numbing habit of assuming everyone here is incapable of critical thinking or of constructive criticism - of Obama administration policies or of anything else. Perhaps, if you were able to refrain from continuously making false assumptions about people who comment here and from always lumping everyone here as a group living outside the realm of reality, then we might see more interesting and productive discussion about some very critical issues, including constructive criticism of President Obama and his administration's policies. I would be happy to do so if I saw any evidence that most are capable of critical thinking or constructive criticism of Obama administration policies. But most everyone else starts from the premise, "Everything Obama does with regards to police is goodness and light" and debates from THAT assumption.. This amnesty for 5-6 million illegals is a perfect example..
On what planet is it logical whereas a government can dump 5-6 million new workers into a job pool that sees unemployment at over 11% and expect good things to happen?? My assumptions AREN'T false... Within the few exceptions outlined, my assumptions are dead on ballz accurate, as my previous Amnesty For Illegals demonstrates.. If people want me to be LESS critical of Obama, then they need to be MORE critical of Obama..
You don't see it, Michale, but, you are largely responsible for it. What's happening here in Wegantia has less to do with me and more to do with the fact that Obama's approval numbers are underwater and have been for quite some time..
Well, that tight race just got a boost with 524 Dem votes that are illegal..